Upper Delaware River rafting trips are for first-timers, young families, and Zen floats. We were looking for an easy float trip with great scenery and fun waves close to New York City and Philadelphia. Upper Delaware Scenic and Recreational River satisfied our longing for adventure in our own backyard. Port Jervis, the southern entrance to the park, is only two hours from New York City and only three hours from Philadelphia, so it was the perfect choice. We met at the Pennsylvania Welcome Center off US-84 in Matamoras. There we saw a model of an aqueduct built in 1848 by John Roebling. We learned that the Roebling Bridge in Lackawaxen, Pa., is the oldest existing wire cable suspension bridge in the United States. We decided to float the section of river that would take us past this bridge. From Matamoras we drove through Port Jervis and turned onto the Upper Delaware Scenic Byway, which runs along the Delaware River all the way to Hancock, NY. The Delaware River starts in the Catskill Mountains in eastern New York and runs 331 miles, past Trenton and Philadelphia, to the Delaware Bay. 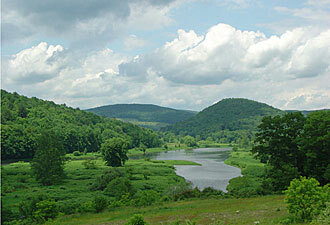 The first 73.4 miles, along the New York-Pennsylvania border, is a part of the National Wild and Scenic Rivers System and is managed by the National Park Service. 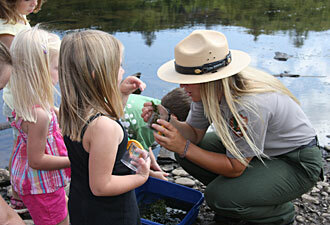 There are several outfitters that offer canoe, raft, and kayak rentals. We selected one near Barryville, NY. Our package included camping along the river, so after getting settled, we spent the rest of the day wading in the river and relaxing at the campsite. The next morning the outfitter bused our group up the road to our launch site. At the river we selected our canoes, kayaks, and paddles and were each fitted with a life jacket. Before going on the river we listened to a safety briefing, which advised us to wear our life jackets whenever we were in the river. We also took along old sneakers, hats, sunscreen, sun glasses, extra clothes, lunch, water, and fishing gear. The water was perfectly clear, and, with sunny skies above, we glided down the river with very little paddling. We used our paddles mostly to steer our boats and to splash each other. We took an occasional swim and enjoyed casting our lines. Although the water was mostly calm, we enjoyed some Class 1 rapids, which were easy to navigate even for our most inexperienced paddlers. At lunchtime we stopped at the river access in Lackawaxen, Pa., for a scenic view of the Roebling Bridge. Nearby was a large green house, which turned out to be the Zane Grey Museum. At the museum we discovered that the famous Western author, like us, had come to Lackawaxen to escape New York and to fish and paddle on the river. From there we paddled to the Roebling Bridge and walked up a trail on the New York side of the river. Exhibits told us that Roebling built the bridge to carry canal boats across the Delaware River. 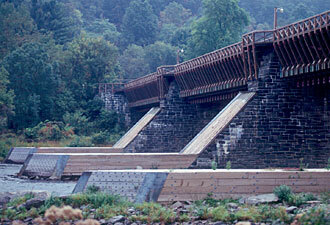 The National Park Service refurbished the bridge using Roebling’s original plans. We finished our trip down the river, turned in our boats and gear, and settled in for another evening of telling stories by the fire. In all, we paddled about 15 miles, explored a free-flowing river, and created memories that will last a lifetime.